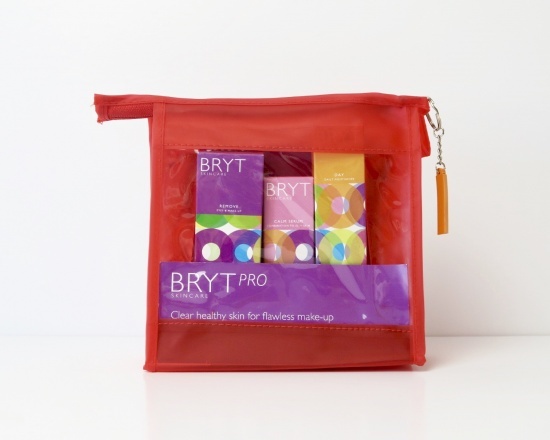 BRYT Pro contains BRYT Remove, BRYT Day Moisturiser, and BRYT Calm Serum. Packaged in a handy transparent case (in assorted colours) with each product 100ml or under, BRYT Pro is ideal for travelling. Using BRYT Pro protects the skin from pollution and toxic damage from make-up and outside forces (specifically, what are known as free radicals). This is done with the assistance of antioxidant ingredients in all our products which help the skin cells regenerate and prevent the skin from oxidising. BRYT Pro enables you to build up a natural protective barrier ensuring that your make-up application is long lasting but most importantly, your skin health and wellbeing is being maintained. Always remember to thoroughly remove make-up at the end of the day - we recommend double cleansing using BRYT Cleanse.